Thanks to in part to Joanna and Chip Gaines and their trademark farmhouse style, this country infused trend has seen a huge rise in popularity as of late — and it's not hard to see why. The pastoral genre exudes a relaxed, comfy vibe that epitomizes the phrase "home, sweet home." 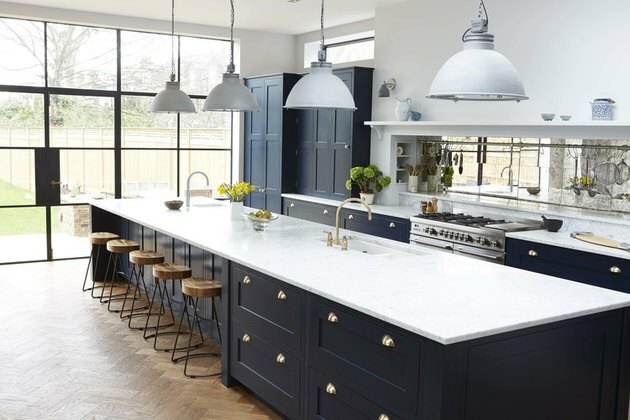 And what better time to show off your farmhouse design savvy than in the heart of your home, also known as the kitchen, where you and your loved ones gather and reconnect. So hold on to your hats! 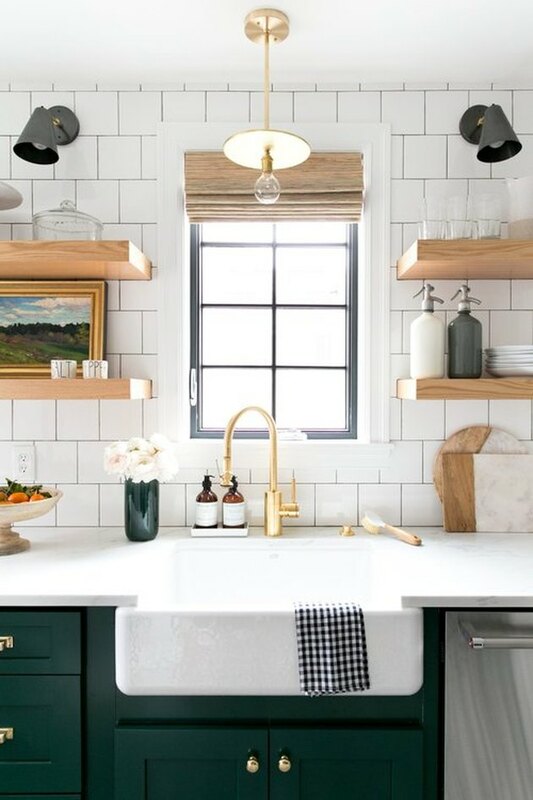 From apron sinks, to sprawling kitchen islands, and shiplap cabinets (and who wouldn't want all of those things), we are about to show you 15 of the most charming farmhouse kitchen ideas. Farmhouse style harkens back to the days when homes were, well, you know, situated on actual farms. So it goes without saying that a staple of country style is natural lighting, and lots of it. 2. Carve out a breakfast nook. 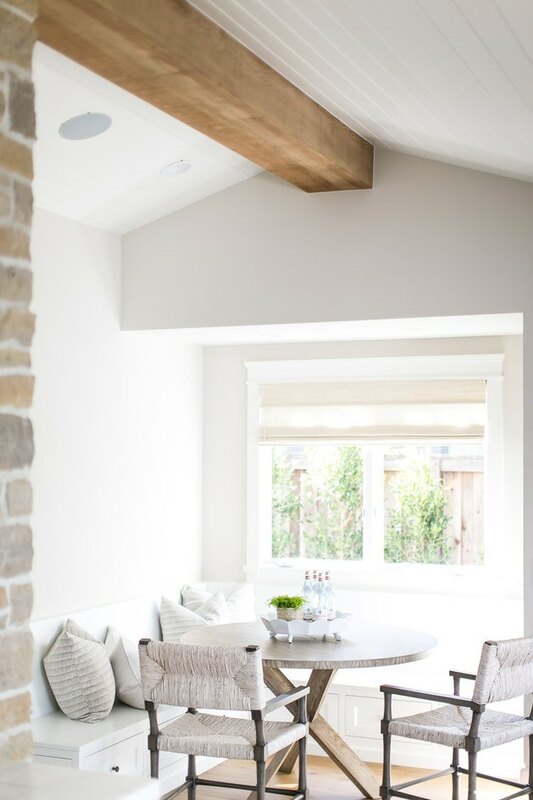 Take advantage of your home's natural alcoves and turn them into cozy spots, like a lovely window bench, or a sweet little breakfast nook. 3. Find bar stools with a twist. 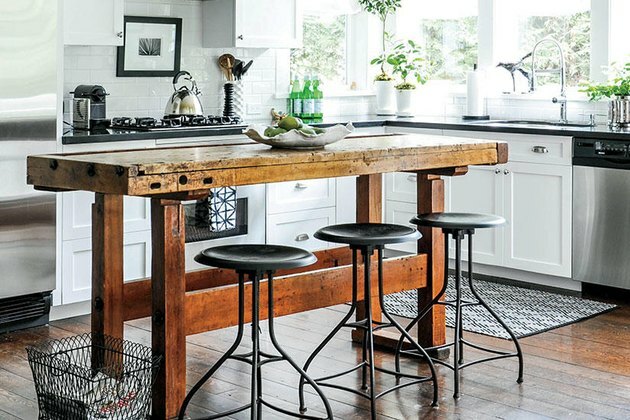 A common occurrence in farmhouse kitchens are counter stools at the kitchen island. 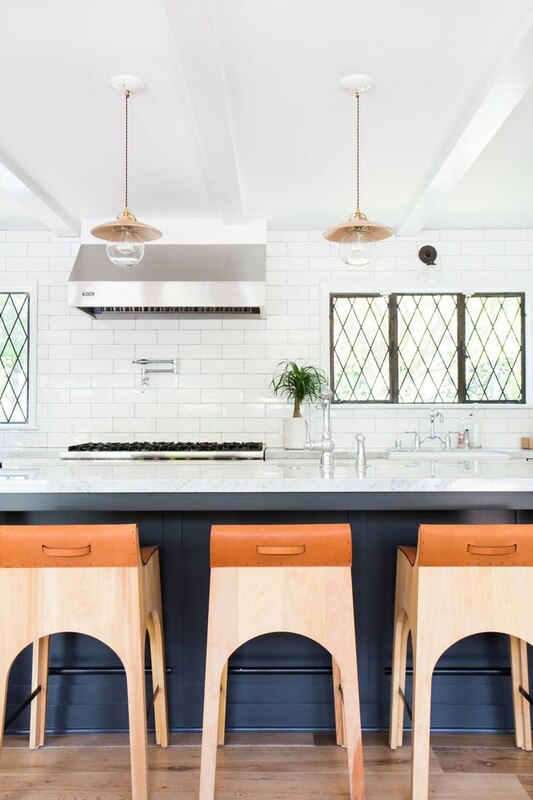 Add some flavor, and go for something a little more industrial or perhaps a bit more modern, like these low-back wood stools with leather seat so your family and friends can lean in and watch your culinary genius at work. 4. Shiplap cabinets are your friend. Shiplap wood paneling and farmhouse style go hand in hand. 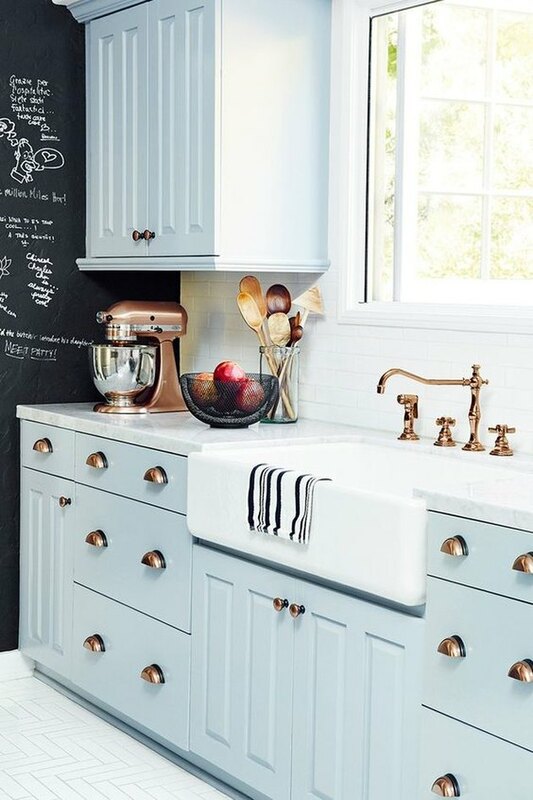 Typically you would see this detailing on the walls, but we think this charming idea looks just as good on kitchen cabinets. 5. Mix and match textures. Don't be afraid to mix and match when it comes to materials and textures. 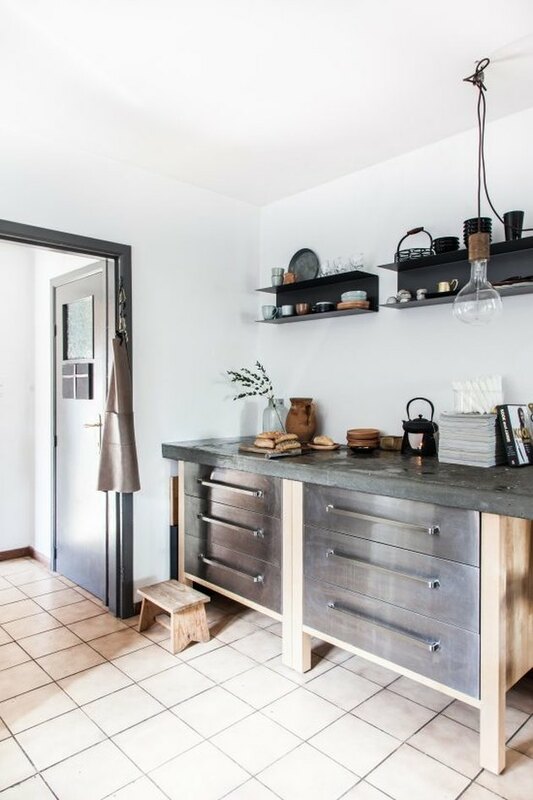 In this kitchen, a DIY concrete countertop pairs beautifully with stainless steel drawer fronts and wood frame cabinets. 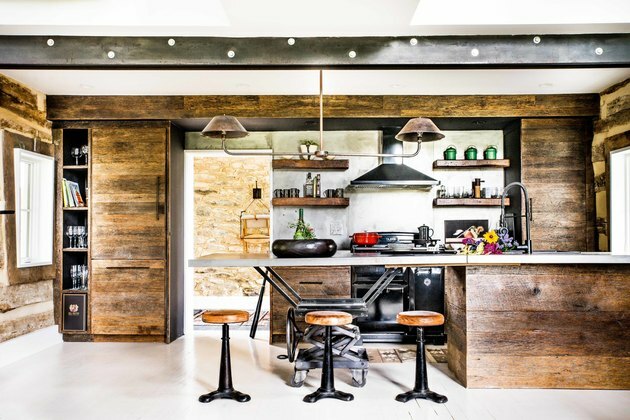 We're just loving the bare-necessities, log cabin-like vibes that this kitchen is giving us. 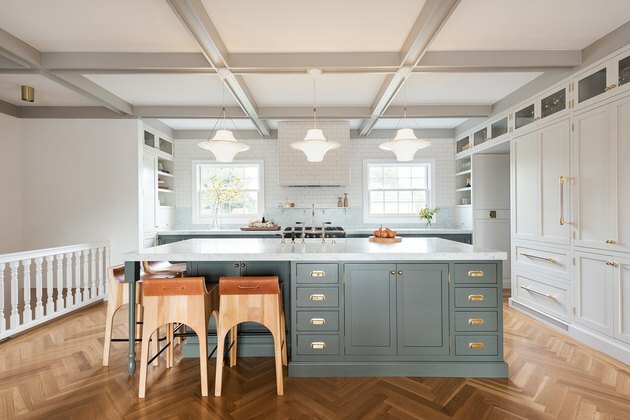 The rustic wood millwork combined with industrial details, like this unique island, imparts a very lodge-esque feeling without being old-fashioned. 7. Opt for a farmhouse sink. Not surprisingly, farmhouse sinks are all the rage in farmhouse kitchens. The deep spacious design of this quaint single basin with apron, provides you with plenty of room to wash those big pots and pans you'll use to create yummy goodness for your dinner guests. 8. Gooseneck faucets add a certain charm. Speaking of washing dishes — a gooseneck faucet is a definite must-have. The long, elegant neck of this faucet, ensures that it won't get in the way when you're trying to maneuver the dirty cookware from last night's dinner party. Besides, let's be honest, it looks pretty snazzy. 9. Make a statement with pendant lights. 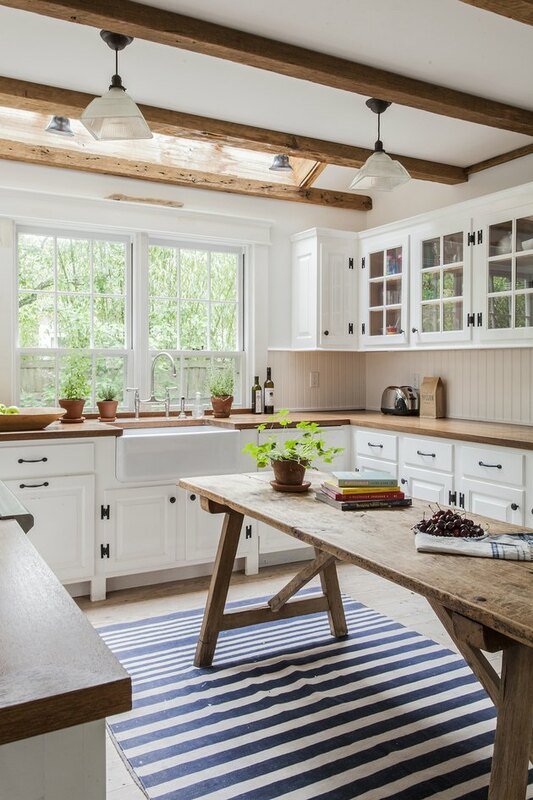 Most modern farmhouse kitchens tend to feature pendant lights above the island workspace. You generally see two or three fixtures hanging in a row, but don't be afraid to get a little creative with the look or arrangement. 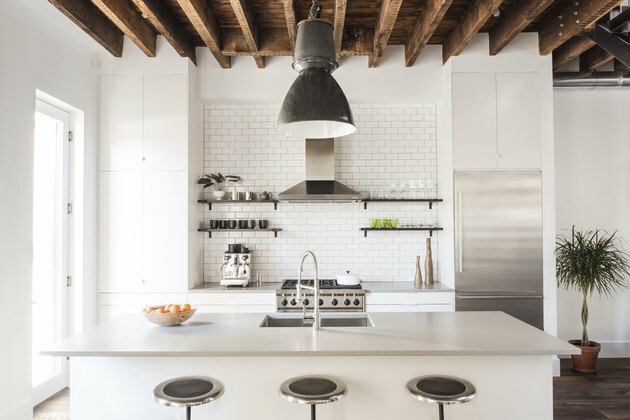 This is a modern farmhouse after all, so make sure your pendant lights make a bold statement. 10. Throw in a pop of color. 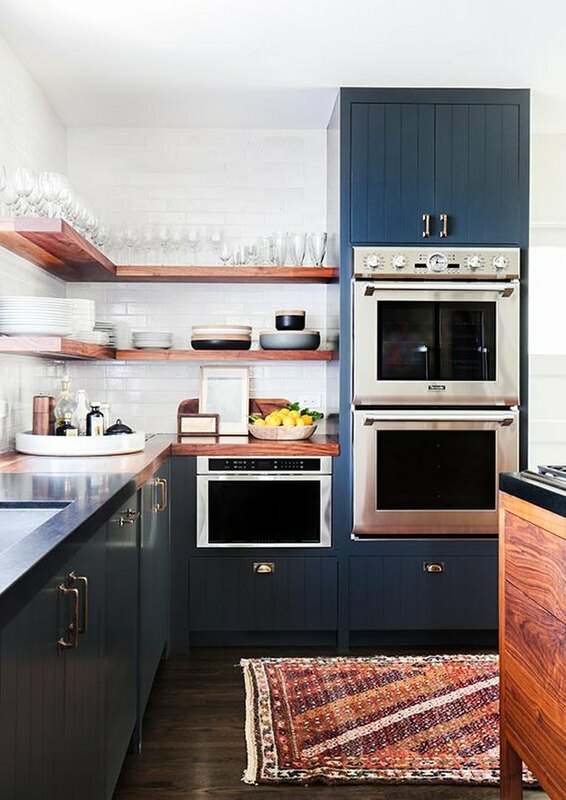 The sweet pop of baby blue is a lovely addition to actress Nina Dobrev's country kitchen. Designed by Consort Design, this inviting gem presents a lovely alternative to the all-white trend. 11. Expose those ceiling beams. 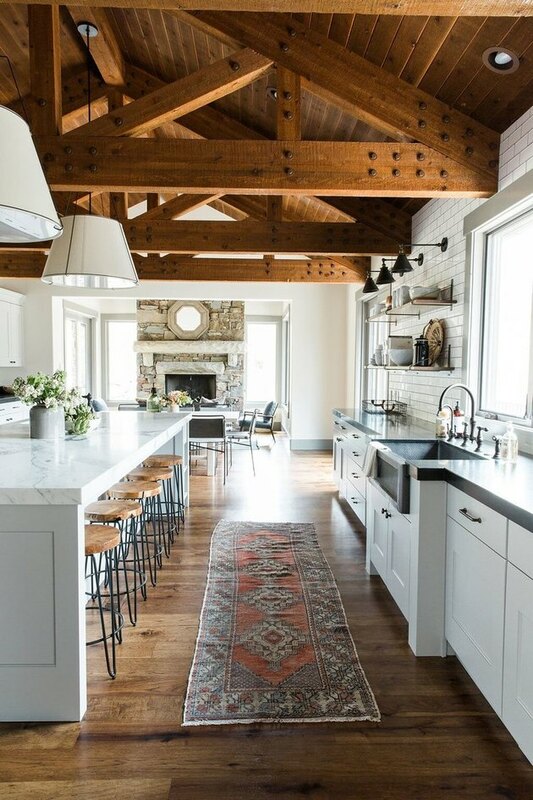 Nothing says "farmhouse" more than exposed wood ceiling beams. Don't you agree? So don't be shy, reveal those beautiful beams. If your kitchen doesn't already have exposed beams, no worries — you can add decorative ceiling beams with an ambitious DIY project. 12. Consider adding an area rug. Incorporating an area rug in the kitchen is all the rage right now. And since farmhouse kitchens are all about comfy vibes, we think that these two are the perfect pair. Trust us, your toes will thank you! 13. Infuse a hint of elegance with brass hardware. Brass details — such as cabinet hardware, faucets, and light fixtures — will bring a delicate elegance to your kitchen. 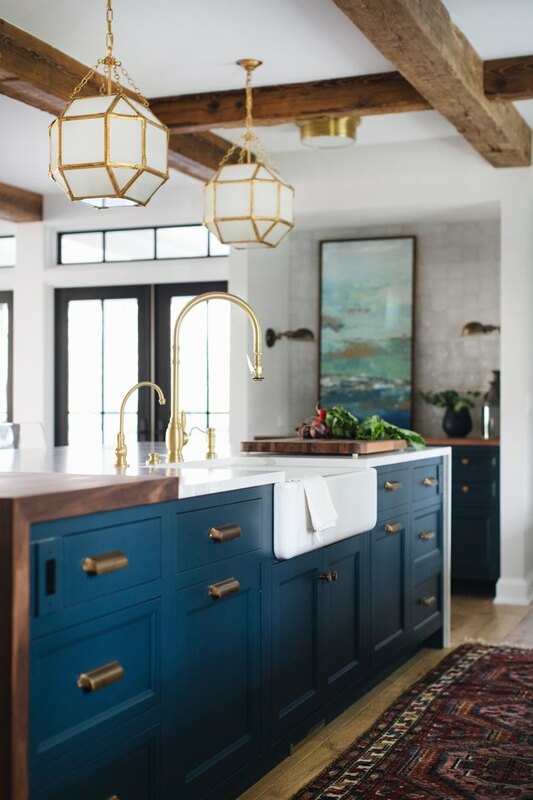 The contrast between the more rustic finishes (typically seen with farmhouse style), and the warm gleaming reflection of brass, is a beautiful sight to see. 14. Go on the hunt for a statement-making island. An island is a pretty standard design element in a farmhouse style kitchen. But there are no rules that say your centrally located worktop has to be topped with a slab of marble. Feel free to think outside the box and go with something a little different, like the rustic wooden workbench used in this kitchen. 15. ...or expand your current kitchen island. Forget the dinner table. Extend your kitchen island to create a casual, statement-making dining experience that the young and the young at heart will love.